When I was first introduced to Indian food it was through a buffet. For a newbie, this provided the opportunity to try different Indian dishes and decide what I did/didn’t like before committing to an entree. Fortunately, I loved the different Indian flavors. Unfortunately, this made deciding on a single entrée more difficult, so I have stuck to buffets when the hunger for Indian food hits. When we first moved to Jacksonville and cravings for curry and tikka masala kicked in, we tried a few of the restaurants on the Southside. The food was good, but none of it blew us away. When we discovered Masala Indian Cuisine in Mandarin, we were pumped. Not only was the food very flavorful, but a lunch buffet is offered 7 days a week. On weekdays, you can eat (or overeat, like I tend to) for $9.99. This increases to a still very reasonable $11.99 on weekends. When our group entered the restaurant, we could hear Bollywood music and smell the mix of spices used to prepare the food. It makes my mouth water every time! As we were shown to our table, we gave the server our drink order and walked to the buffet without even hitting our seats. Our mission was to get our money’s worth for lunch and we weren’t going to let anything stop us. 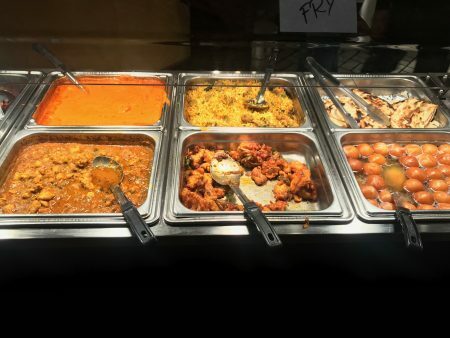 The buffet is split in to two sections, the front half featuring vegetarian options and the back portion has chicken, fish, and goat dishes. Out of all the vegetarian dishes, chana masala and the different paneer dishes are my favorite. Chana Masala ($11.99 on the dinner menu) is a chickpea-based dish in a sauce of tomatoes, onions, and spices (i.e. garam masala, coriander, and ginger). The texture eats meaty and the dish has the perfect combination of familiar and unfamiliar flavors. 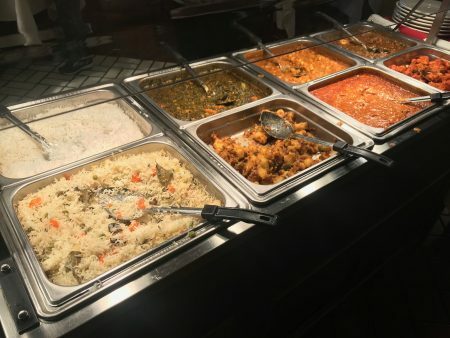 The buffet always has a type of paneer (homemade cheese cubes), either in a palak (spinach-based) or makhani (creamy tomato) sauce ($11.99 each on the dinner menu). Both versions are tasty; the cheese cubes have a bounce to them when you take a bite. They are softened, but not melted by the sauce. I personally prefer the palak paneer since the spinach sauce pairs well with the cheese, almost like Indian creamed spinach. The chicken tikka masala ($12.99 on the dinner menu) is #1 in my book and Masala makes the best I’ve had. The cubes of boneless chicken sit in a tomato sauce, made creamy with yogurt and seasoned with coriander, onion, garlic, etc. They are fork tender, with the perfect amount of flavor from the spices. For someone newer to Indian cuisine, the buffet has tandoori chicken ($12.99 on the dinner menu) which is a great beginner dish. Chicken drums and thighs are marinated in yogurt and spices, cooked crisp in a tandoor oven. The chicken is not served in a sauce and the flavor is mild. The drums serve as a great vehicle for the rainbow of homemade condiments offered. The onion chutney is my favorite by far, combining sweetness and acidity, which pairs well with the rich sauces. Another reason I tend to choose the buffet option when eating Indian is the unlimited naan. The buffet offers the classic version of this pizza crust-like bread. I tend to pass on the rice dishes altogether and put my focus on the fresh naan slices arriving fresh from the kitchen’s clay oven. The bottom is cooked crisp while the top is light and airy. 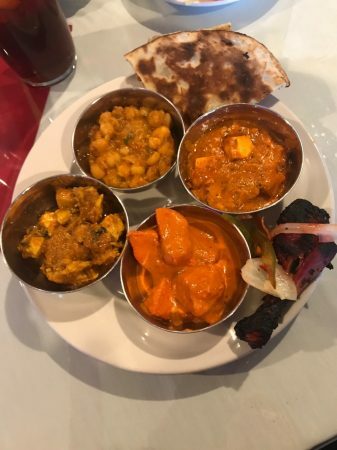 Naan is the perfect vehicle to get all of the deliciousness offered on the buffet where it belongs….in my mouth. There are different versions available on their dinner menu, including chili, onion, garlic, and chicken tikka masala (between $1.99- $4.99 on the dinner menu). Since the dessert stomach is a scientifically proven separate organ (social media says it, so it must be real), I always have a little room for gulab jamoon and Indian rice pudding (Kheer). 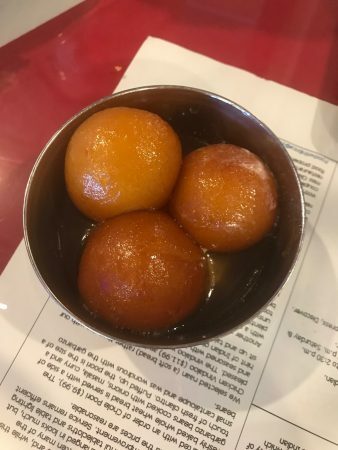 Gulab jamoon ($3.99 on the dinner menu) is a donut hole soaked in a sweet syrup. Dense and rich, I can only eat one. The kheer has a soupy consistency, but is equally as sweet and satisfying as the thicker rice pudding I am more accustomed to. Throughout the meal, the servers were very attentive, filling our drink cups and clearing used dishes. Our entire party felt the food was very fresh, evidenced by the kitchen continuously refilling the buffet. Everything was flavorful- well spiced, but not spicy. From the first-timer to the seasoned Indian food veteran, the experience was a positive one for our group. We all left stuffed- mission accomplished. Tagged Alcohol Serving, authentic, Beer (Breweries and Restaurants), Beer and Wine, buffet, Casual, Dessert, Indian, International, lunch, Serves Alcohol, vegan friendly, Vegetarian Friendly. Bookmark the permalink.